Design stable analog and digital power factor correction stages in minutes! 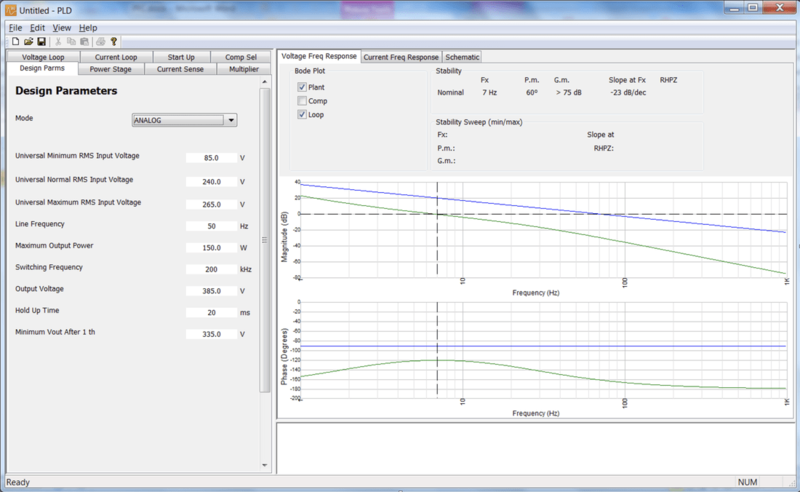 This fantastic software allows the user to design Continuous Conduction Mode Boost PFC power stages in minutes. The user simply selects digital or analog implementation, other general specification and the software will then automatically calculate the appropriate component values and control loop components/digital coefficient for this design. The analog implementation is based Texas Instruments' industry standards UCC3819/UC3852 family of PFC ICs and the digital implementation will provide all necessary control loop coefficients. At any stage the user can change the component values away from those automatically calculated by PLD and enter the actual component value used in their design. From power stage component selection to poles, zeros and controller coefficients; our advanced PFC design software, will greatly simplify your design whilst still keeping you in control at every stage of the process. PLD has been designed as the ultimate toolbox for the power supply design engineer. Stable voltage loop, current loop and Voltage Feedforward design in both analog and digital domains​. PLD control panel allows you to quickly design your PFCs control loops, feedforward and power stage components. All this and more! Download the free trial today! The trial mode is fully featured however, the power rating has been locked. All other features can be used. All attendees to our analog and digital PFC workshops will receive a 6 month complimentary license for WDS. PLD fully supports Digital PFC implementation and can designs stable digital voltage loop, digital current loop and even the digital voltage feedforward VFF filter. To download an evaluation version of PLD please click here. The evaluation version of PLD has full functionality but your input and out voltages and current ranges are limited. If you wish to purchase a license please visit our online store.